GOG.com Community Discussions - for game series. 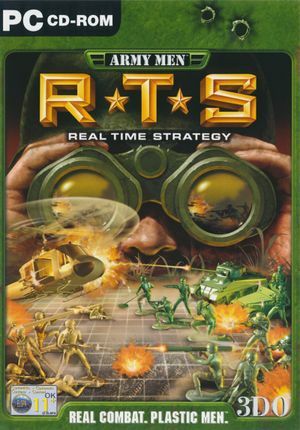 ClanEXF forums - Army Men RTS fan community. Multiplayer hack is a trainer that enables skirmishes against AI opponents in multiplayer, without the need for other players to join via the network. Download the trainer archive, extract the files and run the AMRTS Trainer program. Click Press me to enable button. Start the game and create a new multiplayer game with AI opponents. Special Operations + Intelligence Files is a mod that adds Special Operations missions and Intelligence Files menu that were only available in the console versions of the game. Army Men RTS - high resolution texture pack contains 200 textures updated using an algorithm based on Deep Convolutional Neural Networks. Game switches between high and low quality models depending on the distance from the camera. Open detail.cfg with a text editor. Increase the value of MrmDist, so higher quality models are rendered even far away. data.cfg contains user campaign progress, while save files are inside the saves folder. Only resolutions up to 1280x1024 are available in the options menu, for higher resolutions see Widescreen resolution. Hor+. Camera can be zoomed in/out using in-game controls. Force in the GPU control panel or use dgVoodoo 2. On by default, no option to disable. Maximum 50 FPS in menus and gameplay, 60 FPS during in-game cutscenes. Game only lists first 22 available resolutions in the options menu (usually 1280x1024, 32-bit is the highest resolution available). dgVoodoo 2 can be used to force higher resolutions, while the resolution set in the options menu controls the aspect ratio. Menus and in-game interface (HUD) is scaled properly on very high resolutions and is not small. Copy all the files from the MS folder and paste them into the game installation folder. Run dgVoodooCpl.exe and in the DirectX tab set the desired resolution. (Optional: enable anisotropic filtering, so that menus and text are not pixelated). Click Apply to save the settings, then click OK to exit the program. 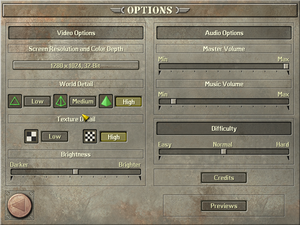 In the game options menu select a resolution that has the same aspect ratio as the one set in dgVoodoo. HUD size can be controlled with the resolution set in the game options menu; the lower the selected resolution, the bigger will the HUD be displayed on screen. In the GPU control panel create a custom ultra-widescreen resolution that is smaller than 1280x1024 (like 1280x540), so it can be selected in the game options menu for the proper aspect ratio. Only the music volume and master volume can be adjusted. ↑ 3.0 3.1 File/folder structure within this directory reflects the path(s) listed for Windows and/or Steam game data (use Wine regedit to access Windows registry paths). Games with Steam Cloud support may store data in ~/.steam/steam/userdata/<user-id>/694500/ in addition to or instead of this directory. The app ID (694500) may differ in some cases. Treat backslashes as forward slashes. See the glossary page for details.